OH GOSH!! THE WHOLE LOT ARE BLOODY CROOKS. IT SEEMS THE FORMER REGIME INCLUDING CABINET AND MINISTERS ARE ALL FRAUDSTERS,DRUG DEALERS,RAPISTS, MASS MURDERERS. HOpe the verdict will be like the Baratha CASE as the victimized could breath in. If the man is charged to keep in jail for the rest of life can give us the right thinking people of the nation can breath in well. And all these properties should be confistcated and auctioned to collect the sums for gaping hip MR s debts. One of the 40 Thieves arrested and when is Ali Baba is going to be arrested. Arrest all these Crooks and hang them in Public. Implement Sharia Law. journalist Ranga is surrouned by all alleged crooks of the previous regime. Here to the scence ONLY Sajin Vaas is missing. Pictures worth thousand words… All high criminals flock together.. this is the best ever picture to clear our thoughts. They have been like fish out of water since FCID or other bodies are on the invesitigations. President should set up a special court with full judicial powers to try all fraudsters in the last Govt (and those presently serving in Parliament) to rid the country of these undesirables AND recover the funds from sale of all their assets. I have the feeling -if conviction would be made like ” Mahindananda should be hung tomorrow”. There will be many that would applause more than ones that dont. Since people are now fed up of these MR backing politicians. If i were ther president of this country, I woudl have used my executive power to confistcate all the assets provably gathered by these politicians not thinking about the poor of the nation. With that funds, I would go for relieve the poor. Using executive powers to do such noble acts would have been praised by anyone with a bird brain. You may be right, Executive powers to be used for the kind of issues .. if not for what ? At this rate, we should be able to reduce the Coconut Thieves Collective aka JO into smithereens. Then flush them down the toilet, to use Retd General Kamal Gunaratne’s words. Let us kill two birds with one shot! k) All other men in various positions that have been further been making the country a pakistan. Martin Luther King Jr was shot dead for dreaming for change, equality, dignity, … . You will be shot dead for demanding justice. Yes, Mahinda should be put in jail for saving the country from terrorist maniacs. Great idea. Two of my cousins were almost killed by these idiots; luckily they didn’t take the train that day. Mahinda put an end to these savages; if he took a few billion in the process, fine with me. this man was part of MR s recent visit made to Korea or Japan or both. So do you think that the bugger MR does not know all these well ? All the high profile fund frauds were known to all of them, like Alibaba and 40 thieves they got shared the earnings. Letting the Rajarata people go dying without dialyse equipments. What had these men been doing for the nation ? Road and Development – this was the redhering to show that Development projects were there, even today there are R and D projects but they dont make big louds on them. I believe changes are now becoming tangible to the average… no doubt about that.. Even Maithriapala sirisena neglected the accusation against him. there so many ministers in the yahapalana govt who are in the same boat. Rajitha Senarathne, wijedasa Rajapakse, Ravi Karunanayake just three in the list. Lanka is filled with all abusive than non-abusive. In that context, you just need to focus on the side of weighing with more crooks. That is what matters right ? Oh gosh the whole lot are bloody crooks. Well you all voted for these Fraudsters?? Surprise?? At last the wheels of justice seem to be turning, slowly but surely. The list is long but I hope all these yob politicians, along with their cronies, are at least named & shamed even if a long jail sentence they deserve won’t be possible due to lack of evidence. The list should also include punks like Vermin Silva who seem to have the intelligence to go under the radar by taking a low profile in recent times. One by one these men should be sent to jail sessions to get shaped. THere they can finally realize the gravity of problems they created. This man Mahindaannanda is no means a good person. 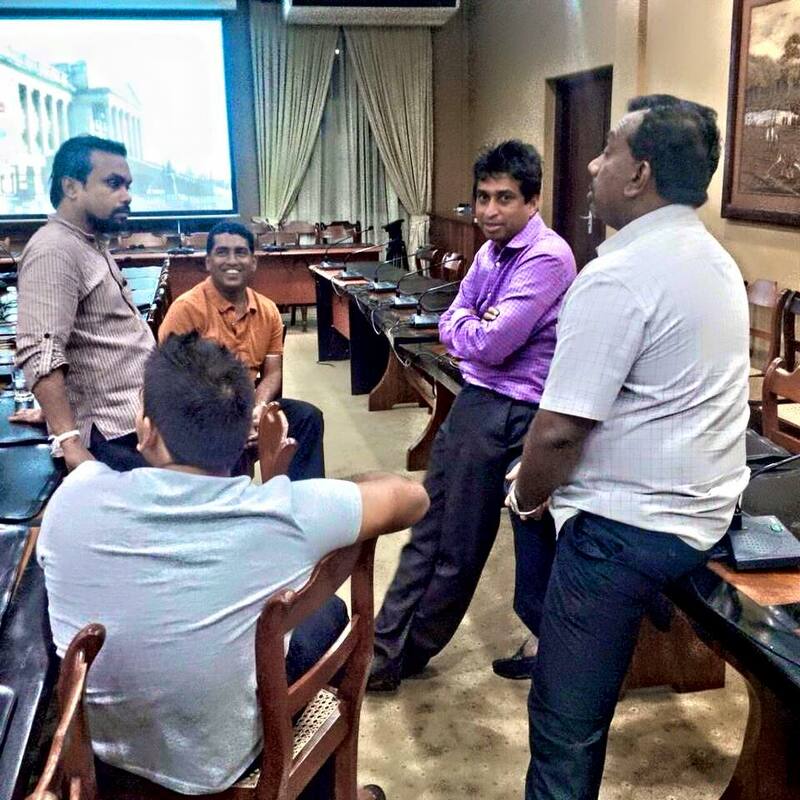 How he once attacked Mr. Ranjan Ramananayake in a TV DISCUSSION; as if they are licensed to react like thugs. All these were made by Rajakashe men. Nation will curse on you Rajapakshe forever. The next will be other Foul Mouth with no limits -Jonsten Fernando…. the other IRC man in the JO fraction… should be taken to custody sooner than later. Then JO will have no power anymore. By anymeans with the number of cases being filed against Wimal Buruwa and the other case being filed to that UDAYA Gonthdiya- they too will have to face it. NFF and PHU willhave to be away from lanken active politics in the days to come. Sha nice. Now run to the temple like your a saint and do a Pooja for your protection. Don’t forget to put those threads around your wrists to show that you have just been cleansed. Did you see Horawansa’s wrists?. One would this his a saint for the number that’s there. The state must confiscate all those ill-gotten wealth, lands and homes owned by this thug politician, if he cannot prove how he earned his income to buy such real estate properties. His tax payments to the State coffers must be investigated and verified for consistency and accuracy. Even his wealth distribution to his kith and kin must be investigated and prompt action to return it to the State if he cannot prove legitimacy in ownership. This is the only way that an effective deterrent be brought on others contemplating coming into politics, thinking to get rich quick through illegal means. I hope something truly worthwhile will come out for the whole country’s people, by this whole exercise of arresting and prosecuting these crooks. All politicians elected by the people, must first be true to the country and their constituency, before themselves. They should constantly be reminded of this goal. May be that’s why Buruwansa visited Malwatte Maha Nayaka a couple of days ago. To plead for mercy and protection for his fellow co-crook through an intermediary. Bad Karma is like a bullock cart ….. the two bullocks should know now. He spoke to Mahanayake about mass graves surfacing in the North and grave consequences ensuing, to the extent of UN handing over North to establish separate Ealam state like they did in Kosovo and Bosnia. Can you imagine the fear in him, and his pandering to be on the ‘safe’ side, rather than ‘sorry’ side. Good work! Mr President Maithripala Sirisena and Prime Minister Ranil Wickremesinghe, we would like to know where all the money for all the huge constructions we see all around Colombo are coming from!? Any chance the Rajapaksa black money is coming into most of these projects!? Panama papers might have the answers to some of them maybe!? If you need ask for INTERPOL (The International Criminal Police Organization) or the CIA for help! Please stop all those involved in this “Game of Shape” (Sri Lankan term for cover up) so that our nation can progress!! His arrest had been anticipated earlier, by Mahinda Rajapakse – in addition to his own. The Ani Corruption mechanism of the government appears to be working, though prompted by other sources, including information divulged in divorce cases, like this one. The Inland Revenue department should be aware of the wealth of individuals. Had Aluthgamage declared all his income and wealth? At last the wheels of Justice are turning…. albeit slowly. Catch them all and hang them one by one. Ensure you get the stolen money back …in cash or in kind and remit them to the depleting Government Coffers !! The Citizens are watching and waiting. These things are just practical jokes. these people go and stay in the paid ward of the hospital and then come live iwth the loot. Nothing recovered. they will contest again to do the same thing. why Ranil Wickramsinghe can not introduce legislation to check these peoples illegally eanred assets and confiscate everything. It is “horage ammagen pena ahanawa” thing happening here.